As fall progresses, many runners will end their racing season and then take a break from training. After a few weeks off they will start in on the next training block with early season preparation. I would like to present a concept that may seem unconventional to some, but could ultimately aid in performance. As a distance runner, have you ever considered replacing a training session with elements that resemble a sprint workout? This idea isn’t really new and some of the concepts have received press and gained traction over the last few years. My hope is to explain this concept a bit more and offer some suggestions for incorporating this into your early season training on a regular basis. Speed/power athletes employ training modalities that are often explosive or maximum efforts. A way to classify this type of training is to call it neuromuscular, or neural, because the primary driver to accomplish the work is related to the Central Nervous System (CNS). Other aspects of training can be classified as metabolic in nature. This insinuates that a fuel must be metabolized to complete the activity. Just about everything that one can think of in relation to traditional endurance training falls in this category: long runs, easy runs, tempo runs, even 400 meter repeats. A rudimentary way to classify an activity as neural is to consider intensity and coordination. The higher the intensity and greater coordination required, the higher the CNS demand. Thus a 50 meter all out sprint is neuromuscular in nature and an easy one hour run would be more metabolic. But having just two broad categories doesn’t really encompass training units accurately. With the two examples given, think of a spectrum. Some activities shade to the CNS side, while others go to the metabolic side. The goal is to group similar types of training units to achieve a maximum training effect (sprinting/jumping vs. easy run/general strength). I want to offer a few different reasons for incorporating this kind of work into your early season distance training. 1. A performance based reason is increased muscle fiber recruitment capabilities. Because of the intensity and coordination required for neural training units, more muscle fibers are recruited in different ways when compared to distance running. With more fibers available to do work, you may be able to increase your ability at a certain task. One example might be “kicking” at the end of a race. Going faster involves putting more force on the ground with each step. If more muscle fibers are trained to do this, they are readily available when more speed is needed. 2. A health reason is injury resistance. Distance running by its nature is a repetitive movement with limited ranges of motion. Many neuromuscular exercises employ large ranges of motions and high intensities. The combination of these two things allows for a varied stimulus on muscles. Stressing the body in these different ways from time to time can help prevent overuse injuries. 3. A practical reason is winter weather concerns. 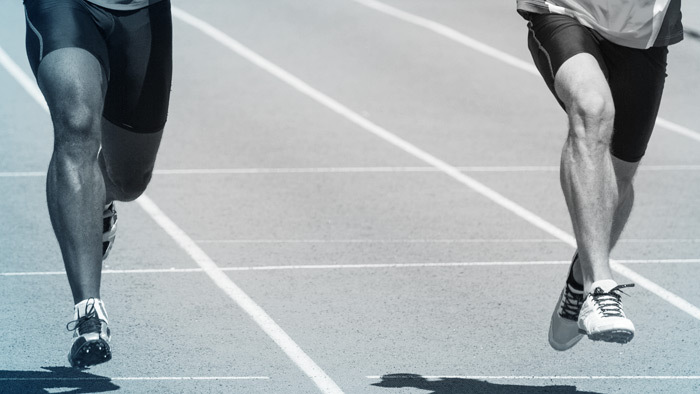 With the exception of some of sprint distances, the vast majority of the exercises that make up neuromuscular activities don’t require a lot of space. Many could be completed at a local rec. center or gym. For the most part, neural activities fall into one of a few categories: Speed training, multi jumps, multi throws, and weight training. The running component. Sprint lengths typically range from 40 to 150 meters. These runs should be completed at near 100 percent effort, with large amounts of recovery, 2 to 8 minutes depending on run distance. Various jump routines that are explosive in nature. These can also vary in complexity. Resisted throws done with a medicine ball, shot put or even a heavy rock. Like the jumps, these are explosive in their execution. Olympic lifts and traditional lifts (squat variations, deadlift variations, upper body presses). Adding resistance is an easy way to manipulate the intensity of an exercise, therefore weight training can be a high CNS demand activity. This requires adhering to certain protocols with sets, reps and weight. While these numbers will vary, suffice to say that the common distance running practice of low weight and high reps is not what you are after here. Due to their intensity, correctly executing these exercises will result in a greater muscle fiber recruitment. Muscles can’t tell the difference between intensity. Meaning sprinting, jumping, and lifting weights recruit muscle fiber in relatively the same way. So doing some kind of jump may be just as useful as doing a squat. The ability to change intensity and vary coordination are primary reason to use different modalities. As there is something to be said about specificity, running at a high speed probably has the greatest transference to running at lower speeds. But that doesn’t mean the other options should be ignored. For example, multi throws are relatively low impact and thus a good alternative for folks that may have an injury and can’t run. Full sessions, which will take 1:45 to 2 hours. Warm up sessions, which will take 30 to 40 minutes. Full Session Early Season, General Preparation. These warm ups work well later in the season as key races approach and full neural sessions are phased out in favor of more specific work. Most runners are familiar with the concept of adapting to a stimulus. In order for that to happen, the stimulus must be consistent in its application. Additionally, the concepts of stabilizing and actualizing an ability require repetition over time. Due to the nonspecific nature of neural sessions for distance running, a balance must be struck with the inclusion of neural work and more tradition distance running activities. A suggestion would be doing a full session every 7 to 14 days during your early season prep. If opting for every 14 days, a neural warm up can be employed during the “off” week. For placement during the week, the best time to do a neural session is when you are most rested. Muscle fatigue from a long run or a hard workout can diminish fiber recruitment ability, so finding the right day will allow for maximum benefits. This happens after a recovery day, but before a metabolic workout on Friday. The neural session would replace the easy run. To hit on a point from earlier, because of the opposite nature of high CNS demand and metabolic demand, it is possible to put these kind of days back to back. It is a fairly safe bet to expect soreness in the days following this kind of session. If you don’t have much background with ancillary training or other movement based activities, it may be best to start with only a few components – potentially just the Mobility, Dynamic Flexibility and Sprint Mechanic pieces. Once you can get through those without lingering soreness, you can progress to the full neural warm up, adding the throws and jumps. Eventually when that becomes comfortable, you can try a full session.